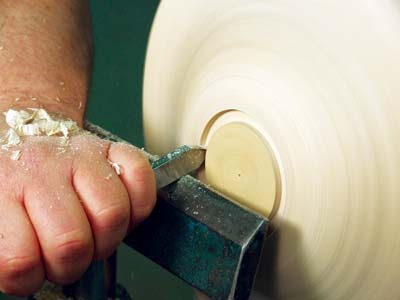 Holding work securely when turning is vital for two reasons: safety and quality - the more securely your work is held, the less likely it is to fly off the lathe and the better your cutting will be. 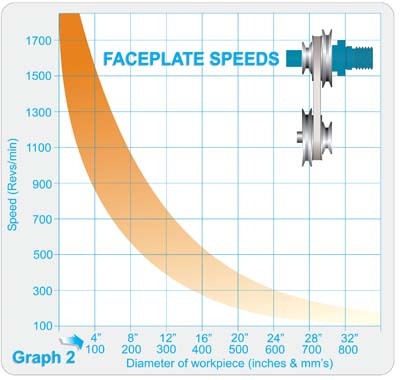 There are numerous ways to hold work, but as mentioned in the previous issue, there are two fundamental types of turning which you are likely to tackle - faceplate and spindle turning - each of which requires a slightly different approach. 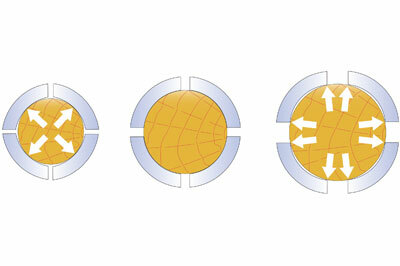 be used for the various type of turning, to help get you started. This style of turning is usually done with the grain at 90° to the axis of the lathe, with bowls & platters being typical projects. 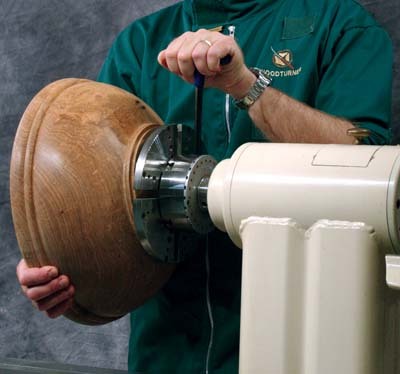 Here the work is usually held with a faceplate, screwchuck or scroll chuck, and these are fixed onto the threaded headstock spindle - the tailstock can be used for additional support. 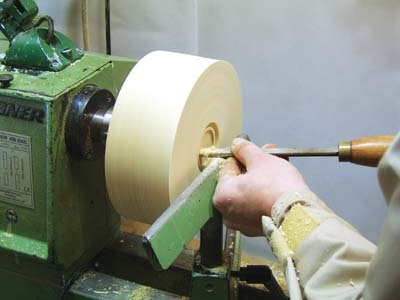 Most beginners will start off buying timber blanks for this type of turning, specially prepared for turners by timber merchants. This is a machined piece of metal which has a threaded female section at the back, which locates onto the spindle of your lathe. 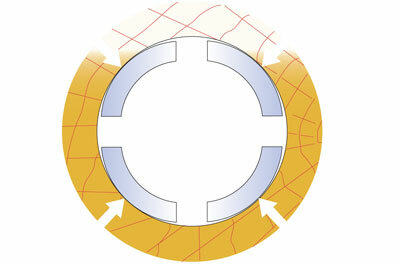 The top section is a flange - available in varying widths - in which is drilled a series of holes. The faceplate is placed on the work as centrally as possible, and then screws are put in through the flange holes and tightened to secure the work. of the bowl. The screws should just be long enough to provide a secure hold but no longer than this or when the bowl is reversed - usually fitted to a scroll chuck - you may not be able to turn away all the screw marks when hollowing out the inside. 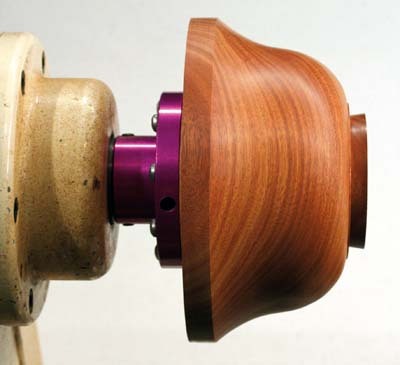 The faceplate is best used on wood with a flat face to prevent any rocking of the chuck. The bigger the work, the wider the faceplate you need to secure it and prevent it from wobbling. There are two types of screw chuck which you are likely to encounter. One is similar to a faceplate but has a screw thread in the centre of the flange, which may also have screw holes in it, too. The other type fixes a screw thread into the centre of the scroll chuck (about which there is more later in this article), and the top rim of the scroll chuck jaws act like the faceplate of the screw chuck. 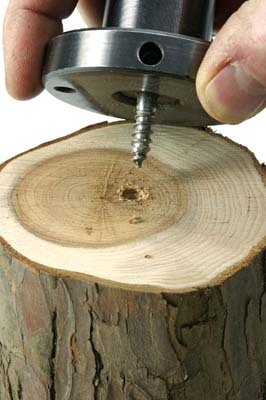 In each case, a hole is drilled into the work to take the screw thread. This chuck is only to be used if the face of the wood is flat - if not the wood may not screw in straight, or be pressed against the faceplate evenly, which may cause it to loosen. The larger the work, the bigger the faceplate section needs to be, to provide proper support. These come in various shapes and sizes but they perform the same basic function. The chuck screws into the headstock spindle and they have moveable jaws, which can be opened and closed to lock onto the work. in the work - this type of fixing is commonly used for wide work like platters - or closed so that the jaws clamp onto a spigot - a round tenon cut on the workpiece. 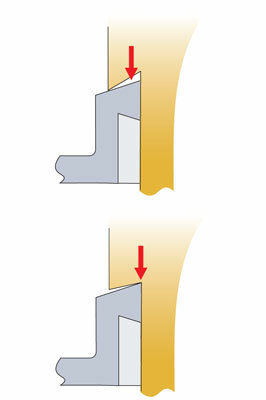 It is important to ensure that the recess or spigot is of a size and shape to allow the jaws to have as much contact with the wood as possible (see diagrams below). The larger the work, the bigger the jaws you need to provide proper support. 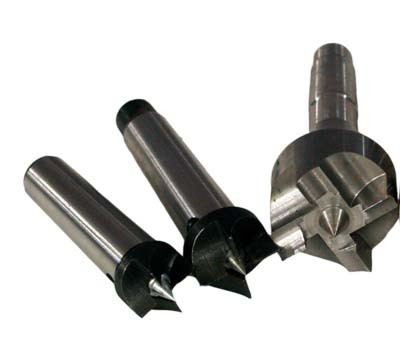 A scroll chuck can be used to hold both faceplate and spindle work but because of grain alignment, you only ever clamp down on spigots if using the scroll chuck for spindle work. 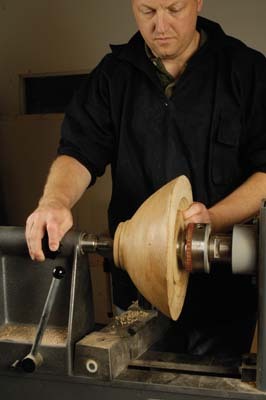 Goblets and one-piece candlesticks are good examples of spindle work that can be made using a scroll chuck. 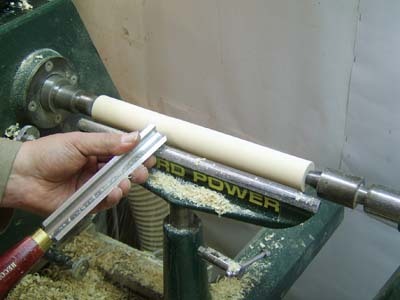 Spindle, or between-centre, turning works with the grain of the wood running parallel to the lathe bed, and produces items such as chair and stair spindles, balusters and goblets etc. The headstock accessories used here are called drive spurs or prong drives. At the other end, the timber needs to be supported, but allowed to turn freely. To that end, revolving centres are fitted in the tailstock. These support the wood but run on bearings to revolve freely. Both the drive spur and the tailstock need to be located as close to the centre of your work as possible. 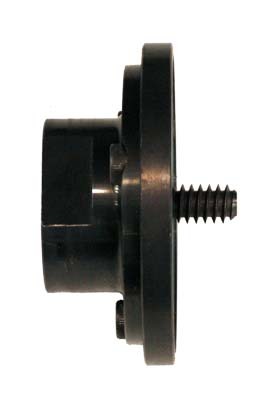 It is vital that the drive spur bites far enough into the wood and that the revolving centre is secure, too. To fix the timber, present the work to the drive spur so the drive's and the work's centre line up, then push the tailstock along the lathe bed so that the revolving centre just touches the centre of the work. Lock the tailstock, then use the hand wheel to wind the centre into the workpiece to provide a bit of pressure and then lock it off. 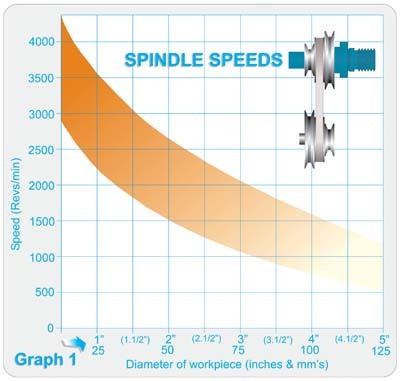 Don't apply too much pressure from the tailstock or you can cause the spindle to bend.